CAT and GSHPx after the injection of only zymosan A and a limited decrease in the activity after the administration of both zymosan A and melatonin. It is suggested that a decreased content of GSH and a decrease in the activity of the studied antioxidative enzymes is caused by the oxidative stress accompanying the inflammation process. Ageing is associated with important changes in gastrointestinal function and in the levels of intestinal hormones secreted. Enterochromaffin (EC) cells containing serotonin (5-HT) and melatonin may play a major role in maintaining gut function during ageing. Our aim was to characterise the mucosal availability of 5-HT and melatonin in the ileum and colon of a mouse model of ageing. Female young mice (2-5 month; n = 6), aged mice (22-24 months; n = 6) and aged mice treated with melatonin (n = 6; 10 mg/kg/day) were examined. contribution on protecting rat gastrointestinal tract I-R injury. gamma rays depended on the time of day that the mice were irradiated. Eksp Klin Farmakol. 2010 Jan;73(1):7-9.
activity of adaptogenic phytopreparations and melaxen. Eksp Klin Farmakol. 2009 Jul-Aug;72(4):3-5. Arushanian EB, Beĭer EV, skorniakoc AA. Eksp Klin Farmakol. 2006 Nov-Dec;69(6):17-9.
and visual functions in anxious subjects. Ovanesov KB, Ovanesova IM, Arushanian EB. Eksp Klin Farmakol. 2006 Nov-Dec;69(6):13-6.
in the course of aging. The aim of this review article is to assess the level of scientific evidence presented by clinical trials of adaptogens in fatigue, and to provide a rationale at the molecular level for verified effects. Strong scientific evidence is available for Rhodiola rosea SHR-5 extract, which improved attention, cognitive function and mental performance in fatigue and in chronic fatigue syndrome. Good scientific evidence has been documented in trails in which Schisandra chinensis and Eleutherococcus senticosus increased endurance and mental performance in patients with mild fatigue and weakness. Based on their efficacy in clinical studies, adaptogens can be defined as a pharmacological group of herbal preparations that increase tolerance to mental exhaustion and enhance attention and mental endurance in situations of decreased performance. The beneficial stress-protective effect of adaptogens is related to regulation of homeostasis via several mechanisms of action associated with the hypothalamic-pituitary-adrenal axis and the control of key mediators of stress response such as molecular chaperons (e.g. Hsp70), stress-activated c-Jun N-terminal protein kinase (JNK1), Forkhead Box O transcription factor DAF-16, cortisol and nitric oxide (NO). The key point of action of phytoadaptogens appears to be their up-regulating and stress-mimetic effects on the “stress-sensor” protein Hsp70, which plays an important role in cell survival and apoptosis. Hsp70 inhibits the expression of NO synthase II gene and interacts with glucocorticoid receptors directly and via the JNK pathway, thus affecting the levels of circulating cortisol and NO. Prevention of stress-induced increase in NO, and the associated decrease in ATP production, results in increased performance and endurance. Adaptogen-induced up-regulation of Hsp70 triggers stress-induced JNK-1 and DAF-16-mediated pathways regulating the resistance to stress and resulting in enhanced mental and physical performance and, possibly, increased longevity. The effect of acute pre-exercise dark chocolate consumption on plasma antioxidant status, oxidative stress and immunoendocrine responses to prolonged exercise. Davison G, Callister R, Williamson G, Cooper KA, Gleeson M.
Department of Sport and Exercise Science, Aberystwyth University, Ceredigion, Aberystwyth, SY23 3FD, UK, gdd@aber.ac.uk. Acute antioxidant supplementation may modulate oxidative stress and some immune perturbations that typically occur following prolonged exercise. The aims of the present study were to examine the effects of acutely consuming dark chocolate (high polyphenol content) on plasma antioxidant capacity, markers of oxidative stress and immunoendocrine responses to prolonged exercise. Fourteen healthy men cycled for 2.5 h at ~60% maximal oxygen uptake 2 h after consuming 100 g dark chocolate (DC), an isomacronutrient control bar (CC) or neither (BL) in a randomised-counterbalanced design. DC enhanced pre-exercise antioxidant status (P = 0.003) and reduced by trend (P = 0.088) 1 h post-exercise plasma free [F(2)-isoprostane] compared with CC (also, [F(2)-isoprostane] increased post-exercise in CC and BL but not DC trials). Plasma insulin concentration was significantly higher pre-exercise (P = 0.012) and 1 h post-exercise (P = 0.026) in the DC compared with the CC trial. There was a better maintenance of plasma glucose concentration on the DC trial (2-way ANOVA trial × time interaction P = 0.001), which decreased post-exercise in all trials but was significantly higher 1 h post-exercise (P = 0.039) in the DC trial. There were no between trial differences in the temporal responses (trial × time interactions all P > 0.05) of hypothalamic-pituitary-adrenal axis stress hormones, plasma interleukin-6, the magnitude of leukocytosis and neutrophilia and changes in neutrophil function. Acute DC consumption may affect insulin, glucose, antioxidant status and oxidative stress responses, but has minimal effects on immunoendocrine responses, to prolonged exercise. Kim T, Davis J, Zhang AJ, He X, Mathews ST.
Department of Nutrition and Food Science, Boshell Diabetes and Metabolic Diseases, Research Program, Auburn University, Auburn, AL 36849, USA. Tumeric is a spice that comes from the root Curcuma longa, a member of the ginger family, Zingaberaceae. In Ayurveda (Indian traditional medicine), tumeric has been used for its medicinal properties for various indications and through different routes of administration, including topically, orally, and by inhalation. Curcuminoids are components of tumeric, which include mainly curcumin (diferuloyl methane), demethoxycurcumin, and bisdemethoxycurcmin. The goal of this systematic review of the literature was to summarize the literature on the safety and anti-inflammatory activity of curcumin. A search of the computerized database MEDLINE (1966 to January 2002), a manual search of bibliographies of papers identified through MEDLINE, and an Internet search using multiple search engines for references on this topic was conducted. The PDR for Herbal Medicines, and four textbooks on herbal medicine and their bibliographies were also searched. A large number of studies on curcumin were identified. These included studies on the antioxidant, anti-inflammatory, antiviral, and antifungal properties of curcuminoids. Studies on the toxicity and anti-inflammatory properties of curcumin have included in vitro, animal, and human studies. A phase 1 human trial with 25 subjects using up to 8000 mg of curcumin per day for 3 months found no toxicity from curcumin. Five other human trials using 1125-2500 mg of curcumin per day have also found it to be safe. These human studies have found some evidence of anti-inflammatory activity of curcumin. The laboratory studies have identified a number of different molecules involved in inflammation that are inhibited by curcumin including phospholipase, lipooxygenase, cyclooxygenase 2, leukotrienes, thromboxane, prostaglandins, nitric oxide, collagenase, elastase, hyaluronidase, monocyte chemoattractant protein-1 (MCP-1), interferon-inducible protein, tumor necrosis factor (TNF), and interleukin-12 (IL-12). Curcumin has been demonstrated to be safe in six human trials and has demonstrated anti-inflammatory activity. It may exert its anti-inflammatory activity by inhibition of a number of different molecules that play a role in inflammation. Interaction: No known interaction, individual with liver malfunction is supposed to take this product. Pregnant and lactating women are not supposed to take the injection and other same kind of supplementary. Dosage and method: 1-3 ampoules weekly by intravenous or intramuscular method. 1. What is glutathione? It is an important chemical that acts as a powerful antioxidant to preserve and protect the brain and other body tissues by protecting them from the damage of free radicals. 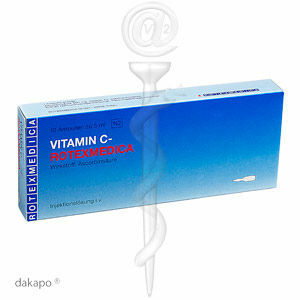 It also acts to recycle vitamin C & E which also reduce free radicals. 2. What studies prove it work or are there any studies that prove it works? The landmark study was done by the Department of Neurology, University of Sassari, Italy in 1996. 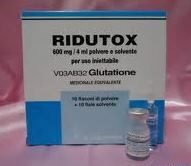 In this study all patients improved significantly after glutathione therapy with a 42% decline in disability. 3. What is glutathione used for? It has been used to treat all symptoms of neurodegenerative diseases such as Parkinson’s, Alzheimer’s, multiple sclerosis, stroke, ALS, irritable bowel, and chronic fatigue. 4. What improvement in symptoms can one expect? Many patients have had profound improvements with respect to reduction of rigidity, increased mobility, improved ability to speak, less depression, and decreased tremor. Glutathione has the added benefit of protecting the brain from free radical damage, thus possibly slowing the progression of the underlying illness. 5. How long can a person take glutathione and how long will the effect last after I stop using it? It can be taken permanently. In the 1996 Italian study the therapeutic effect lasted 2-4 months after therapy was stopped. 6. How long has this treatment been used. Physicians have been using glutathione infusions for at least 30 years, probably longer. 7. How is the treatment given? It is given intravenously in the arm by IV push over 10 to 15 minutes usually three times a week in a physician’s office. If you choose to take LA supplements, the Linus Pauling Institute recommends a daily dose of 200-400 mg/day of racemic LA for generally healthy people. Alpha-lipoic acid (LA), also known as thioctic acid, is a naturally occurring compound that is synthesized in small amounts by plants and animals, including humans (1, 2). Endogenously synthesized LA is covalently bound to specific proteins, which function as cofactors for several important mitochondrial enzyme complexes (see Biological Activities below). In addition to the physiological functions of protein-bound LA, there is increasing scientific and medical interest in potential therapeutic uses of pharmacological doses of free LA (3). LA contains two thiol (sulfur) groups, which may be oxidized or reduced (Figure). The reduced form is known as dihydrolipoic acid (DHLA), while the oxidized form is known as LA (4). LA also contains an asymmetric carbon, meaning there are two possible optical isomers that are mirror images of each other (R-LA and S-LA). Only the R– isomer is endogenously synthesized and bound to protein. Free LA supplements may contain either R-LA or a 50/50 (racemic) mixture of R-LA and S-LA (see Supplements below). LA is synthesized de novo from an 8-carbon fatty acid (octanoic acid) in mitochondria, where protein-bound LA functions as an enzyme cofactor. Recent evidence suggests that LA can be synthesized “on site” from octanoic acid that is already covalently bound to LA-dependent enzymes (5, 6). The final step in LA synthesis is the insertion of two sulfur atoms into octanoic acid. This reaction is catalyzed by lipoyl synthase, an enzyme that contains iron-sulfur clusters, which are thought to act as sulfur donors to LA (7, 8). The gene for lipoyl synthase has recently been cloned, and research is underway to learn more about its regulation (9). Exogenous LA from the diet can be activated with ATP or GTP by lipoate activating enzyme, and transferred to LA-dependent enzymes by lipoyl transferase (10, 11). Consumption of LA from foods has not yet been found to result in detectable increases of free LA in human plasma or cells (3, 12). In contrast, high oral doses of free LA (50 mg or more) result in significant but transient increases in free LA in plasma and cells. Pharmacokinetic studies in humans have found that about 30-40% of an oral dose of racemic LA is absorbed (12, 13). Oral LA supplements are better absorbed on an empty stomach than with food. Taking racemic LA with food decreased peak plasma LA concentrations by about 30% and total plasma LA concentrations by about 20% compared to fasting (14). After oral dosing with racemic LA, peak plasma concentrations of R-LA were found to be 40-50% higher than S-LA, suggesting R-LA is better absorbed than S-LA (12, 14, 15). Both isomers are rapidly metabolized and excreted. Plasma LA concentrations generally peak in one hour or less and decline rapidly (12, 13, 15, 16). In cells, LA is quickly reduced to DHLA, and studies in vitro indicate that DHLA is rapidly exported from cells (3). R-LA is an essential cofactor for several mitochondrial enzyme complexes that catalyze critical reactions related to energy production and the catabolism (breakdown) of alpha-keto acids and amino acids (17). In each case, R-LA is covalently bound to a specific lysine residue in one of the proteins in the enzyme complex. The pyruvate dehydrogenase complex catalyzes the conversion of pyruvate to acetyl-coenzyme A (CoA), an important substrate for energy production via the citric acid cycle. The alpha-ketoglutarate dehydrogenase complex catalyzes the conversion of alpha-ketoglutarate to succinyl CoA, another important citric acid cycle intermediate. The activity of the branched-chain ketoacid dehydrogenase complex results in the catabolism of the branched-chain amino acids, leucine, isoleucine and valine (18). The glycine cleavage system is a multi-enzyme complex that catalyzes the oxidation of glycine to form 5,10 methylene tetrahydrofolate, an important cofactor in nucleic acid synthesis (19). When considering the biological activities of supplemental free LA, it is important to keep in mind the limited and transient nature of the increases in plasma and tissue LA (see Metabolism and Bioavailability above) (3). Scavenging Reactive Oxygen and Nitrogen Species: Reactive oxygen species (ROS) and reactive nitrogen species (RNS) are highly reactive compounds with the potential to damage DNA, proteins and lipids (fats) in cell membranes. Both LA and DHLA can directly scavenge (neutralize) physiologically relevant ROS and RNS in the test tube [reviewed in (3)]. However, it is not clear whether LA acts directly to scavenge ROS and RNS in vivo. The highest tissue concentrations of free LA likely to be achieved through oral supplementation are at least 10 times lower than those of other intracellular antioxidants, such as vitamin C and glutathione. Moreover, free LA is rapidly eliminated from cells, so any increases in direct radical scavenging activity are unlikely to be sustained. Regeneration of Other Antioxidants: When an antioxidant scavenges a free radical, it becomes oxidized itself and is not able to scavenge additional ROS or RNS until it has been reduced. DHLA is a potent reducing agent with the capacity to reduce the oxidized forms of several important antioxidants, including vitamin C and glutathione (20). DHLA may also reduce the oxidized form of alpha-tocopherol (the alpha-tocopheroxyl radical) directly or indirectly, by reducing the oxidized form of vitamin C (dehydroascorbate), which is able to reduce the alpha-tocopheroxyl radical (21). Coenzyme Q10 is an important component of the mitochondrial electron transport chain that also has antioxidant activity. DHLA can also reduce oxidized forms of coenzyme Q10 (22), which may also reduce the alpha-tocopheroxyl radical (23). Although DHLA has been found to regenerate oxidized antioxidants in the test tube, it is not known whether DHLA effectively regenerates other antioxidants under physiological conditions (3). Metal Chelation: Redox-active metal ions, such as free iron and copper, can induce oxidative damage by catalyzing reactions that generate highly reactive free radicals (24). Compounds that chelate (bind) free metal ions in a way that prevents them from generating free radicals offer promise in the treatment of neurodegenerative and other chronic diseases, in which metal-induced oxidative damage may play a role (25). Both LA and DHLA have been found to inhibit copper- and iron-mediated oxidative damage in the test tube (26, 27), and to inhibit excess iron and copper accumulation in animal models (28, 29). Induction of Glutathione Synthesis: Glutathione is an important intracellular antioxidant that also plays a role in the detoxification and elimination of potential carcinogens and toxins. Studies in animals have found that glutathione synthesis and tissue glutathione levels are significantly lower in aged animals than in younger animals, leading to decreased ability of aged animals to respond to oxidative stress or toxin exposure (30). LA has been found to increase glutathione synthesis in cultured cells and in the tissues of aged animals fed LA. Recent research suggests that LA may increase glutathione synthesis in aged animals by increasing the expression of gamma-glutamylcysteine ligase (GCL), the rate-limiting enzyme in glutathione synthesis (31) and by increasing cellular uptake of cysteine, an amino acid required for glutathione synthesis (32). Insulin Signaling: The binding of insulin to the insulin receptor (IR) triggers the autophosporylation of several tyrosine residues on the IR. Activation of the IR in this manner stimulates a cascade of protein phosphorylations, resulting in the translocation of glucose transporters (GLUT4) to the cell membrane and increased cellular glucose uptake (3, 33). LA has been found to increase GLUT4 translocation to cell membranes and to increase glucose uptake in cultured adipose (fat) and muscle cells (34, 35). Although LA does not appear to bind to the IR like insulin, it can activate the insulin signaling cascade in cultured cells, possibly by acting as a mild oxidizing agent (3, 33). PKB/Akt-dependent Signaling: In addition to insulin signaling, phosphorylation and dephosphorylation of other cell signaling molecules affect a variety of cellular processes, including metabolism, stress responses, proliferation and survival (3). One such molecule is protein kinase B also known as Akt (PKB/Akt). The addition of LA to cultured cells has been found to activate PKB/Akt-dependent signaling resulting in increased survival of neurons (36). LA administration improved nitric oxide-dependent vasodilation in aged rats by increasing PKB/Akt-dependent phosphorylation of endothelial nitric oxide synthase (eNOS), which increases eNOS catalyzed production of nitric oxide (37). Redox-Sensitive Transcription Factors: Transcription factors are proteins that bind to specific sequences of DNA and promote or repress the transcription of selected genes. Some transcription factors are sequestered outside the nucleus until some sort of signal induces their translocation to the nucleus. Oxidative stress or changes in the balance between oxidation and reduction (redox status) in a cell can trigger the translocation of redox-sensitive transcription factors to the nucleus. One such family of redox-sensitive transcription factors, known as nuclear factor-kappa B (NF-KB), regulates a number of genes related to inflammation and cell cycle control, which are involved in the pathology of diabetes, atherosclerosis and cancer (19). Physiologically relevant concentrations of LA added to cultured cells have been found to inhibit NF-KB nuclear translocation (38). Another redox-sensitive transcription factor known as Nrf2 enhances the transcription of genes that contain specific DNA sequences known as antioxidant response elements (AREs). LA has been found to enhance the nuclear translocation of Nrf2 and the transcription of genes containing AREs in vivo, including genes for GCL, the rate-limiting enzyme in glutathione synthesis (31). LA deficiency has not been described, suggesting that humans are able to synthesize enough to meet their needs for enzyme cofactors (39). Chronically elevated blood glucose levels are the hallmark of diabetes mellitus (DM). In type 1 DM, insulin production is insufficient due to autoimmune destruction of the insulin-producing beta-cells of the pancreas. Type 1 DM is also known as insulin-dependent DM, because exogenous insulin is required to maintain normal blood glucose levels. In contrast, impaired cellular glucose uptake in response to insulin (insulin resistance) plays a key role in the development of type 2 DM (40). Although individuals with type 2 DM may eventually require insulin, type 2 DM is also known as noninsulin-dependent DM because interventions that enhance insulin sensitivity may be used to maintain normal blood glucose levels. There is limited evidence that high doses of LA can improve glucose utilization in individuals with type 2 DM. A small clinical trial in 13 patients with type 2 DM found that a single intravenous infusion of 1000 mg of racemic LA improved insulin-stimulated glucose disposal (insulin sensitivity) by 50% compared to a placebo infusion (41). In an uncontrolled pilot study of 20 patients with type 2 DM, intravenous infusion of 500 mg/day of racemic LA for 10 days also improved insulin sensitivity measured 24 hours after the last infusion (42). A placebo-controlled study of 72 patients with type 2 DM found that oral administration of racemic LA at doses of 600 mg/day, 1200 mg/day or 1800 mg/day improved insulin sensitivity by 25% after 4 weeks of treatment (43). There were no significant differences among the three doses of LA, suggesting that 600 mg/day may be the maximum effective dose (40). Data from animal studies suggests that the R-isomer of LA may be more effective in improving insulin sensitivity than the S-isomer (35, 44), but this possibility has not been tested in any published human trials. The inner lining of blood vessels, known as the endothelium, plays an important role in preventing vascular disease. Endothelial function is often impaired in diabetic patients, who are at high risk for vascular disease (45). Intra-arterial infusion of racemic LA improved endothelium-dependent vasodilation in 39 diabetic patients, but not in 11 healthy controls (46). Endothelial function can be assessed noninvasively by using ultrasound to measure flow-mediated vasodilation, which is endothelium-dependent (47). A randomized controlled trial assessed the effect of oral LA supplementation on flow-mediated vasodilation in 58 patients diagnosed with the metabolic syndrome, a condition of abnormal glucose and lipid (fat) metabolism (48). Oral supplementation with 300 mg/day of LA for 4 weeks improved flow-mediated vasodilation by 44% compared to placebo. Diabetic patients are also at high risk of microvascular disease, which may contribute to diabetic neuropathy (40). In an uncontrolled study, oral supplementation with 1200 mg/day of racemic LA for 6 weeks improved a measure of capillary perfusion in the fingers of 8 diabetic patients with peripheral neuropathy (49). While these results are encouraging, long-term randomized controlled trials are needed to determine whether LA supplementation can reduce the risk of vascular complications in individuals with diabetes. 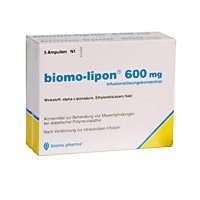 Intravenous and oral LA are approved for the treatment of diabetic neuropathy in Germany (4). More than 20% of diabetic patients develop peripheral neuropathy, a type of nerve damage that may result in pain, loss of sensation and weakness, particularly in the lower extremities (40). In addition to the pain and disability caused by diabetic neuropathy, it is a leading cause of lower limb amputation in diabetic patients (50). The results of several large randomized controlled trials indicate that maintaining blood glucose at near normal levels is the most important step in decreasing the risk of diabetic neuropathy (51, 52). However, such intensive blood glucose control may not be achievable in all diabetic patients. A meta-analysis that combined the results of four randomized controlled trials, including 1258 diabetic patients, found that treatment with 600 mg/day of intravenous racemic LA for 3 weeks significantly reduced the symptoms of diabetic neuropathy to a clinically meaningful degree (53). The efficacy of oral LA in the treatment of diabetic neuropathy is less clear. A short-term study of 24 patients with type 2 DM found that the symptoms of peripheral neuropathy were improved in those who took 1800 mg/day of oral racemic LA for 3 weeks compared to those who took a placebo (54). A much larger clinical trial randomly assigned more than 500 patients with type 2 DM and symptomatic peripheral neuropathy to one of the following treatments: 1) 600 mg/day of intravenous racemic LA for 3 weeks followed by 1800 mg/day of oral racemic LA for 6 months, 2) 600 mg/day of intravenous racemic LA for 3 weeks followed by oral placebo for 6 months, or 3) intravenous placebo for 3 weeks followed by oral placebo for 6 months (55). Although symptom scores did not differ significantly from baseline in any of the groups, assessments of sensory and motor deficits by physicians improved significantly after 3 weeks of intravenous LA therapy. Motor and sensory deficits were also somewhat improved at the end of 6 months of oral LA therapy, but the trend did not reach statistical significance. In the longest controlled trial of oral LA therapy, 299 patients with diabetic peripheral neuropathy were randomly assigned to treatment with 1200 mg/day of racemic LA, 600 mg/day of racemic LA or a placebo (56). However, after 2 years of treatment, only 65 of the original participants were included in the final analysis. In that subgroup, those who took either 1200 mg/day or 600 mg/day of LA showed significant improvement in electrophysiological tests of nerve conduction compared to those who took the placebo. Another neuropathic complication of diabetes is cardiovascular autonomic neuropathy, which occurs in as many as 25% of diabetic patients (40). Cardiovascular autonomic neuropathy is characterized by reduced heart rate variability, and is associated with increased risk of mortality in diabetic patients. In a randomized controlled trial of 72 patients with type 2 DM and reduced heart rate variability, oral supplementation with 800 mg/day of racemic LA for 4 months resulted in significant improvement in 2 out of 4 measures of heart rate variability compared to placebo (57). Overall, the available research suggests that treatment with 600 mg/day of intravenous LA for 3 weeks significantly reduces the symptoms of diabetic peripheral neuropathy. Although the benefit of long-term oral LA supplementation is less clear, there is some evidence to suggest that oral LA may be beneficial in the treatment of diabetic peripheral neuropathy (600-1800 mg/day) and cardiovascular autonomic neuropathy (800 mg/day). Feeding high doses of LA to mice with experimental autoimmune encephalomyelitis (EAE), a model of multiple sclerosis (MS), has been found to slow disease progression (58, 59). In these animals, LA feeding appeared to inhibit the migration of inflammatory T cells into the brain and spinal cord, possibly by inhibiting the activity of an enzyme known as matrix metalloproteinase (MMP)-9. A small pilot study designed to evaluate the safety of LA in 30 people with relapsing or progressive MS found that treatment with 1200-2400 mg/day of oral LA for 2 weeks was generally well-tolerated (see Safety), and that higher peak serum levels of LA were associated with greater decreases in serum MMP-9 levels (60). However, this pilot study was not designed to assess the clinical benefit of LA. Larger, long-term clinical trials are needed to assess the safety and efficacy of LA in the treatment of MS (61). LA alone or in combination with other antioxidants or L-carnitine has been found to improve measures of memory in animal models of age-associated cognitive decline, including rats (62, 63), mice (64) and dogs (65). However, it is not clear whether oral LA supplementation can slow cognitive decline related to aging or other pathology in humans. An uncontrolled, open-label trial in 9 patients with Alzheimer’s disease and related dementias, who were also taking acetylcholinesterase inhibitors, reported that oral supplementation with 600 mg/day of racemic LA appeared to stabilize cognitive function over a one-year period (66). However, the significance of these findings is difficult to assess without a control group for comparison. A randomized controlled trial found that oral supplementation with 1200 mg/day of racemic LA for 10 weeks was of no benefit in treating HIV-associated cognitive impairment (67). Although studies in animals suggest that LA may be helpful in slowing age-related cognitive decline, randomized controlled trials are needed to determine whether LA supplementation is effective in preventing or slowing cognitive decline associated with age or neurodegenerative disease. >Curcumin is an AMPK activator and induces glutathione synthesis – no need for AICAR? Curcumin has been shown to exert a variety of beneficial human health effects. However, mechanisms by which curcumin acts are poorly understood. In this study, we report that curcumin activated AMP-activated protein kinase (AMPK) and increased glucose uptake in rat L6 myotubes. In addition, curcumin activated the mitogen-activated protein kinase kinase (MEK)3/6-p38 mitogen-activated protein kinase (MAPK) signaling pathways in the downstream of the AMPK cascade. Moreover, inhibition of either AMPK or p38 MAPK resulted in blockage of curcumin-induced glucose uptake. Furthermore, the administration of curcumin to mice increased AMPK phosphorylation in the skeletal muscles. Taken together, these results indicate that the beneficial health effect of curcumin can be explained by its ability to activate AMPK-p38 MAPK pathways in skeletal muscles. J. Cell. Physiol. 223:771-778, 2010. © 2010 Wiley-Liss, Inc.